After reading James’ poem ‘This Shell’, the evocative first line, “My house grows like the chamber’d nautilus”, played through my mind, slowly evolving into “My mouth-nose like the chamber’d nautilus.” I had, at the time, been researching James’s life and looking at countless photographs and documents from the Archive. As I continued developing drawings for the mouth-nose sculpture, the decision was made to turn it into a portrait of Edward James, incorporating his profile and setting the shell-head onto a pair of slender cloud-shoulders, which could be seen as a subtle reference to his association with Ren Magritte. Other references were more direct: the angle of the head is taken from a photograph of James walking outside West Dean House with his then wife, Tilly Losch, an image originally featured in The Sketch magazine on 18th May 1932. The chambered nautilus is a sea creature that lives in the outermost segment of its shell. Inside there are many chambers, each one smaller in size, each one sealed off and disused. The formation of the shell is a beautiful design, a logarithmic spiral or Spira Mirabilis [L. ‘miraculous spiral’]. 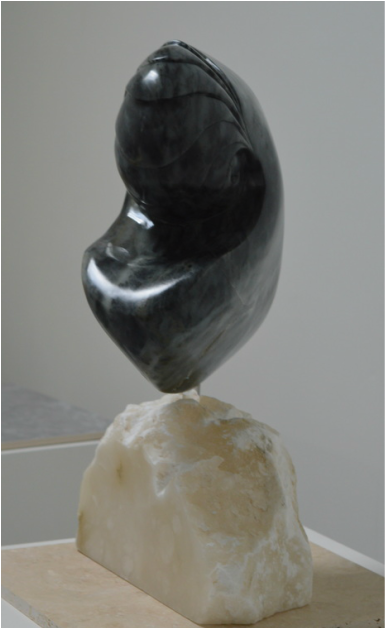 The shell-head is carved out of black and white soapstone, chosen for its greeny-grey underwater appearance. The cloud-shoulders are bianco opaco alabaster. They seem too slight to support the much larger head, adding to the sculpture’s feeling of precariousness. The juncture between the two pieces is formed by a length of acrylic rod, a visually delicate yet rigid material that links the head and shoulders while allowing them to remain incomplete fragments.